In many ways, 11-year-old Arman Darbo is like other kids his age. Born in Paris and raised in Beijing, he attended the Lycée Français, speaks fluent Mandarin, and enjoys playing football in his spare time. 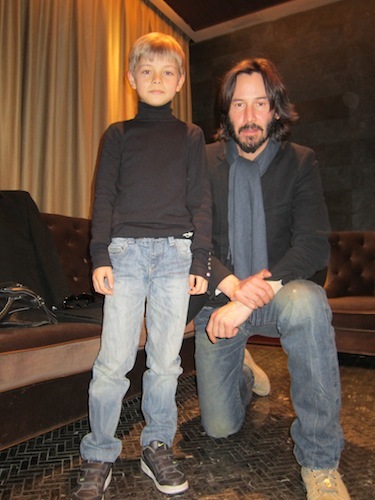 However, not many 11-year-olds can say they’ve met Keanu Reeves and starred in a film with rising Chinese action star Tiger Chen (陈虎). The kicker? Arman was only 8 years old at the time. He plays one of the central characters in Kung Fu Man, a Keanu Reeves-produced film about a kidnapped American boy who gets rescued by a Chinese man. The film is slated for release across China on July 19 and co-stars Vanessa Branch (Pirates of the Caribbean), Jiang Mengjie (Dream of Red Mansions), and Chyna McCoy (Lawrence Fishburne’s stunt double in The Matrix). Kung Fu Man was shot on location in Dali, Hong Kong, and even a cruise ship to Taiwan. The Darbos have been living in Beijing for eight years. Arman attended the French School until last year, but the family has been away from China for the past eight months and has recently just returned to Beijing. Arman’s experience with Kung Fu Man led him to take up Shaolin wushu. This summer, he will attend the Lee Strasberg Young Actors Institute in Los Angeles. beijingkids caught up with Arman and his dad, Igor, to find out what it was like to star in Kung Fu Man. Igor, how did Arman get involved with Kung Fu Man? The producers had started auditioning kids in Los Angeles, but could not find the right person for the role. Then, they got the idea to audition foreign kids living in Beijing. Since Arman had done commercials and TV series, a few agents introduced him to the casting director. Then he auditioned, got a call back, did another test with Tiger, and finally got the part! What kind of projects has Arman done in the past? Arman acted in various CCTV Kids youth series, such as “My DV Diary” and “3 Crazy Girls." After Kung Fu Man, he played the role of a Jewish refugee boy in 1942 Shanghai in a Sino-Australian coproduction entitled “Deep Sleep No More”. We first arrived on set at the beginning of November 2009, right after Arman turned 8. We shot in Yunnan for about two months, then wrapped up principal photography in March 2010 with a week of shooting onboard a cruise ship from Hong Kong to Taiwan. Then began the long process of post-production and planning for the release date of the film [on July 19]. As a parent, what did you enjoy the most about the experience? The intensity – seeing Arman getting into character and having a blast. We definitely got closer helping him, rehearsing, and discussing every aspect of the shoot. Being at the center of this big complicated machine and learning from actors from different backgrounds, Arman definitely gained a lot in maturity – and this was wonderful to see. Safety was a big one, as Arman’s role was pretty physical and demanding. He found himself running and jumping on rooftops, in the middle of fierce kung fu fights, wire-cabled in the air … Fortunately, the stunt team was very professional and included He Jun, a coordinator who works with Jackie Chan on all his films. The [cast and crew]all became good friends with Arman, who was able to communicate with them thanks to his fluent Mandarin. Arman, what was your favorite part of being in Kung Fu Man? Flying with cables when I had to fall from high up! What was your biggest challenge and the proudest accomplishment? Crying for real in a car that was heading off a cliff. It was really hard because we filmed it in the very first days of the shooting, and I had to cry at the same time as the other actress. Were you nervous before meeting Tiger for the first time? I am never really nervous before I meet anyone. The best thing about Tiger is that he is very nice. He taught me not to complain and to believe in myself. Yes, that and becoming a professional soccer player! I hope I get more chances to play in good movies with Tiger and maybe other actors too. I like action and comedy. Tell us about your time at the Lee Strasberg Young Actors Institute. I took some acting classes in Los Angeles this winter at the TVI Actors Studio and really enjoyed it. This time, I signed up for an interview with Lee Strasberg Institute because they’re supposed to be the best. I was a bit nervous for the interview, but it went well and I got in. I am looking forward to the classes, especially the improv sessions and being back in Los Angeles. We’ve got yearly passes to Universal Studios and I can’t wait to go there again! What advice do you have for other aspiring young actors? I think that when you are a young actor, it is better to actually feel the emotions in real life instead of pretending to cry, feel mad, be extra happy, etc.